Use these macros to show or list Scenarios that you previously created. Or, use a macro to create a new Scenario. To list all the Scenarios on a worksheet, you can adapt the following macro. 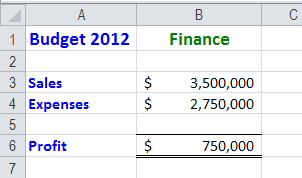 This example lists all the Scenarios from the Budget worksheet, starting the list in cell A2 on the Lists worksheet. It then sorts the list alphabetically. The sample workbook has Scenarios for the Finance and the Marketing budgets. In this macro, a Scenario for the Sales department will be added. On the Ribbon's Data tab, click Data Validation. On the Error Alert tab, remove the check mark from Show error alert after invalid data is entered. 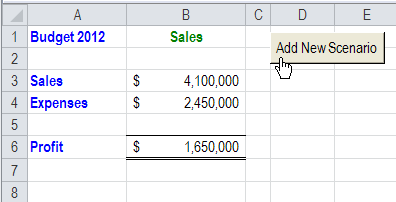 The Budget worksheet has event code that displays a Scenario when a Scenario name is selected in cell B1. The following revised code will handle errors if a new Scenario name is entered in cell B1. MsgBox "That Scenario is not available"
Choose File | Close and Return to Microsoft Excel. To create a new Scenario on a worksheet, you can adapt the following code. This example creates a Scenario from the data entered on the Budget worksheet, and uses the department name as the Scenario name. & vbCrLf & "Please try a different name." (optional) Add a button to the worksheet, to run the CreateScenario Macro, as shown below. Note: When opening the workbook, you will have to enable macros in order to use this code. 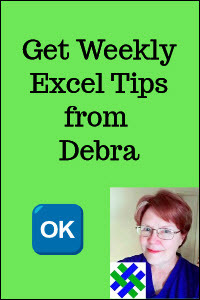 Click this link to get the Excel Scenarios Macros workbook. The zipped file contains macros, so be sure to enable macros when you open the workbook, if you want to test the code.